Kathryn Wayne-Spindler & Associates Divorce Attorneys have been practicing in Michigan for more than 20 years. Contact the law office at 248-676-1000 for a Clare Divorce Lawyer. 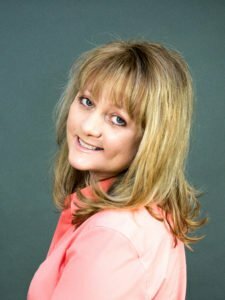 Kathryn Wayne-Spindler and her associates take pride in winning difficult divorce cases and helping clients achieve optimal support settlements. Although we are known for our aggressive protection of our clients’ interests in Michigan Divorce cases, we are also compassionate and sympathetic when it comes to discussing the emotional strains of divorce. Whether you’re just starting to investigate divorce or or have already filed and just want some assistance with documents, the Kathryn Wayne-Spindler & Associates attorneys have the experience and creative problem solving to assist you. Contact the office of Kathryn Wayne-Spindler & Associates in Milford, Michigan at 248-676-1000 for a Clare Divorce Lawyer you can trust. 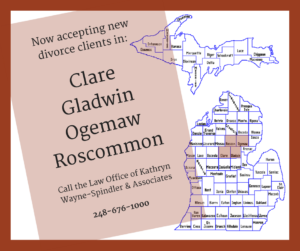 Experienced Michigan Attorneys at Kathryn Wayne-Spindler & Associates are accepting new divorce clients in four mid-Michigan counties of Clare, Gladwin, Ogemaw and Roscommon. The Michigan Family Law Attorneys of Kathryn Wayne-Spindler & Associates have one simple objective for our clients: to handle all of your legal worries so you can concentrate on life and family. Contact Kathryn Wayne-Spindler & Associates today to learn more about our experience and success at 248-676-1000. Our legal service area includes these communities: Clare; Harrison; Farwell; Hayes; Garfield; Hamilton, Surrey; Sheridan; Greenwood; Freeman; Frost; Hatton; Lincoln and Franklin and many more. The Clare County Circuit Court is located at 225 West Main St., Harrison, MI 48625. The hours are M – F 8:00 a.m. to 4:30 p.m. For more information about the court, check out the 55th Circuit Court website.